Turkish Airlines, a leader in terms of international destinations served and Africa’s top international carrier, is also becoming a leader in giving back to countries facing some staggering challenges. Starting in March, the airline began delivering aid to help the people of Somalia suffering from the famine and drought besetting the country where millions of children are at immediate risk of severe malnutrition. The first delivery included 60 tons of nutritional supplements designed specifically for children, who are at greatest risk. Working with the group Love Army for Somalia, which is spearheaded by social media stars and actor Ben Stiller, the supplies were sent to Mogadishu for immediate distribution. "As the first call of help to Somalia echoed in social media, Turkish Airlines immediately took notice,” M. İlker Aycı, Turkish Airlines Chairman of the Board and Executive Committee, said. Since that first delivery, the airline has delivered hundreds of tons of supplies to the people of Somalia to date. Most recently, another shipment consisting of food and an additional 60 tons of the nutritional supplements for kids was delivered on August 15. 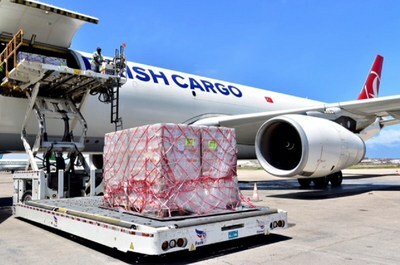 As the only international airline that flies to Somalia, Turkish Airlines has a unique ability to getting much-needed emergency food support to the country, which is suffering from a devastating drought. Following the supplies arrival in Mogadishu, non-governmental organizations including the American Red Cross have provided logistics and guidance on the ground, ensuring that the lifesaving supplements reach the most at-need children and their families. The airline has been involved in a number of corporate responsibility projects throughout Africa. Recent projects undertaken in 24 African countries include building and renovating schools, orphanages, clinics as well as providing education and drilling water wells. Setting up solar panels for clinics situated outside urban areas and cooperating with local authorities and hospitals to provide medical aid are also among Turkish Airlines’ corporate responsibility projects.